After a stretch of wins starting in late January where the C’s won 10 of 12 contests, capped with a big win at home vs. Chicago last week, things have began to fall apart in Boston. The Celtics found themselves spiraling downhill in the past week, losing four straight as of last night against the Mavs. Whenever things start to look up, the cards just seem to stack up against the C’s. As if losing Brandon Bass to a knee injury and KG to family issues wasn’t enough, the Celts lost Rondo for last night’s matchup and Wednesday’s due to a two game suspension. Adding insult to injury, literally, Jermaine O’Neal and Chris Wilcox both left the game in the third last night with injuries. Don’t get me wrong, I love my boy Stiemsma, but unfortunately I don’t see him being the X-factor in the paint for the C’s, at least not yet. 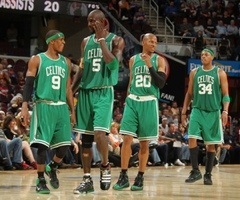 I think it’s safe to say no one needs the All-Star break to come sooner than the Celts. A week off from play after Wednesday’s game vs. the Thunder is just what the team needs to regroup and get back to their winning ways. This entry was posted in Celtics and tagged boston, boston celtics, boston sports blog, Chris Wilcox, greg stiemsma, Jermaine O'Neal, kevin garnett, nba, NBA All-Star Break, rajon rondo, Suspension by jtulz07. Bookmark the permalink.